We’ve been watching the weather forecasts avidly over the last few weeks and the big worry, of course, was that conditions might be wet, muddy and miserable. It’s hard to believe that we’re planning to water the track tonight! Back to Dressage….phase one is over and there were lots of lovely tests to watch today. Oliver Townend has maintained his overnight lead on Imperial Master in the CIC*** class and has also grabbed 2nd place on the leaderboard, with a score of 43.5 on ODT Sonas Rovatio. Vittoria Panizzon (ITA), riding Rock Model lies in 3rd place on 44.4, while Katie O’Sullivan and Kilpatrick Dancer have dropped into 4th position. In the CIC** class, Patricia Ryan and Lady Chatterbox are in front with a score of 47.5, with Elizabeth Halliday-Sharp (USA) close behind on a score of 48.1 with Newmarket Malt. Elizabeth also holds 5th place overnight with HSS Cooley. Michael Ryan and Ballylynch Sky High are on 48.9 in 3rd place and Luke Drea currently lies in 4th with a score of 50.6 on Gorsehill Pearl. Ellen Fitzsimons and First Night are the overnight leaders in the CCIJ* class, on 48.5 and Giulio Guglielmi (ITA) is just half a penalty point behind on Porche Renkum. 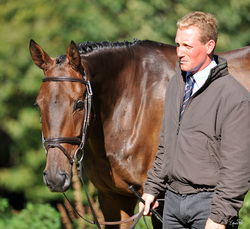 Slaney Ronan heads out tomorrow in 3rd position, with a score of 50.8 on Really Rich. Finally, George Russell did a lovely test on Kilcoltrim Cara and leads the Michael Leonard Memorial Championship class on a score of 24.8. Camilla Speirs lies 2nd overnight with 31.3 on BT Dancing Queen. Nicola Ennis, with Briary Swan and Patricia Ryan, with Mac Carrick both finished today on 32.5. So, dressage done and dusted. Roll on tomorrow….hope you’ll all enjoy the day!